“Until you get to the top of this castle, you cannot log out of your own free will.”, eerily floating mid-air, a virtual figure of twenty-meter tall man with hooded robe draped around croaks monotonously. There is no face to be seen beneath the hood, all there is empty space of pure blackness, reflecting the gloom that starts to engulf thousands of players currently logged-in, jailed in a game that was supposed to serve as a sort of sweet escapism. A degree of dreadful seriousness seeps in as death in the game, the instant players’ health points drop to zero, equals to fried brains in the real world. Akayaba Akihiko, a prodigy that heads the development of a cutting-edge virtual reality online game ‘Sword Art Online’, and the identity behind the faceless calamity, presses further with his grandiose speech. “___regretfully 213 players have already exited this game, and the real world forever.” The staggering number of deaths rings a bitter truth. The only way out is to clear the world, ‘Aincrad’, a floating castle made of iron and stone, consisting of 100 floors of cities, small towns, villages, forests, grasslands, lakes, and massed legions of hostile and absurdly powerful creatures. Our main protagonist, the fourteen year-old boy Kirigaya Kazuto aka ‘Kirito’, is to reach the 100th floor and escape the death game. Aside from his on-going work Accel World, Kawahara Reki has another opportunity here to show us that other way, to (again) stretch the boundaries of what is possible in a novel centered around virtual-reality and online game. And yes, Kawahara’s penned Sword Art Online is definitely innovative, possesses grandeur, moral heft and emotional depth, making Accel World becomes pales in comparison. A simple proof to do justice for my singing praises on this piece of work is that when the novel was still officially a web-novel, the author’s personal page was viewed 6.5 million bloody times! Now folks, let us get deeper into proper examination of the series. 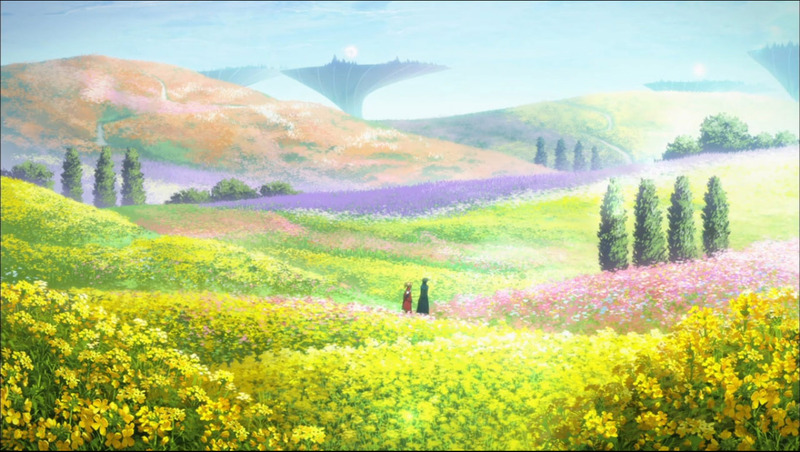 ‘Sword Art Online’ does a spectacular job in pulling and plunging us straight into its territory. Kawahara breezes through the difficulty of projecting an imaginary world with mere texts, and this is made possible by his rigorous attention to minute details of all the in-game systems and settings. It paints a crystal clear picture of his world inside the readers mind, graciously helping them walking deep into Aincrad to experience the exhilaration themselves. As a game that transfers all five senses and consciousness into a digital environment, the size of Sword Art Online’s world Aincrad is implausibly immense and expansive, yet on contrary lacks splendor and seems purely monochrome at one point. 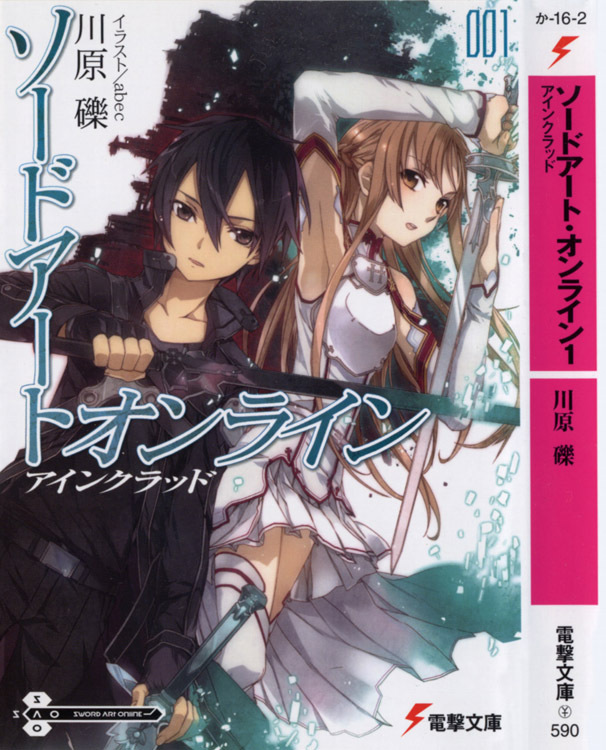 In an era dominated by spectacle, fantasy and glamour, Kawahara offers something simple and compact, which reflected in its plain character designs, non-existent job system, and its world fixation on sword skills minus too fancy of an effect, throwing magical skills to the back burner. As a result, the fight sequences are considerably vivid, visceral, and raw. A universe that keeps on expanding, his imaginary world does not sprawl nor goes unmanageable. He keeps firm control over things. Three subsequent games to SAO have been laid on the table so far (the death game is only the first game out of God knows how many, and it ends rather early), all of which the word ‘audacious’ and ‘original’ could be etched to this masterpiece. A stunning aerial battle of magic in the exotic world of fairies: ‘Alfheim Online’, a modern warfare taking place in the apocalyptic landscape of ‘Gun Gale Online’, and a scenic bucolical world that is the closest to reality so far, ‘Underworld’, all have their own distinctive features that stir the interests of gamers and non-gamers alike. I, for one, really am intoxicated. The story itself moves forward with smooth parallel timeline and flashbacks as its main components, yet still feels neatly structured in term of narration. And a story-telling method of this kind has the advantage of rocketing readers toward early excitement, which is suitable for inviting a positive first impression. It also creates opportunity for author to harkens back to previous arc to tie up loose ends, of which is a job well-done for Kawahara Reki. 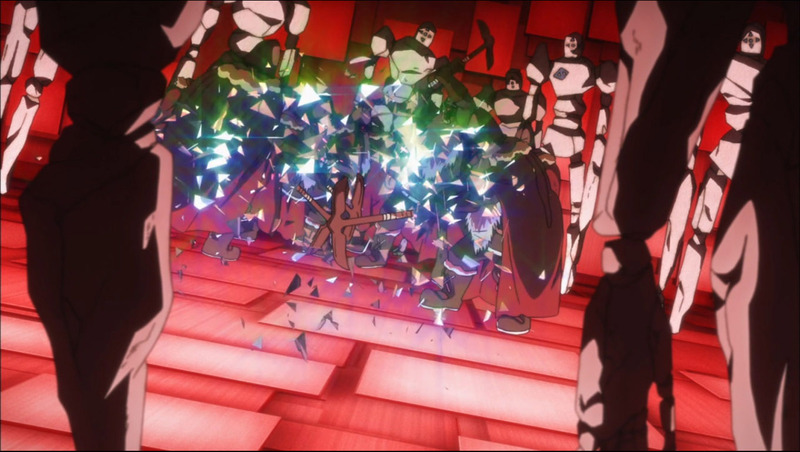 During the early stretches of Sword Art Online, death in the form of players breaking into fragments of blue polygons gave way to resistance. It felt clunky and unreal, but the lofty ambitions of Kirito and Asuna, who desperately try to keep players from dying in vain and to survive themselves, followed by their numerous grievous failings to do so, slowly sinks us into acceptance. Death is deadly serious, they say, and yes the message is now well received. Death also accidentally, if not meticulously planned beforehand by Akayaba Akihiko, pulls out various colors of the human behavior. A number of players decides to commit an act of suicide out of despair, some chooses to stay in safety and wait for help from outside world (that sadly, never came), a few brave hearts charge to the frontline in an attempt to clear the cursed game, while several deranged, psychopath-killers in a cult-like guild called ‘the Laughing Coffin’, which becomes an unexpected symbol of terror in Aincrad, mercilessly steal and kill fellow human beings. Kawahara pictures these tumultuous sparks of the human nature fairly accurate. 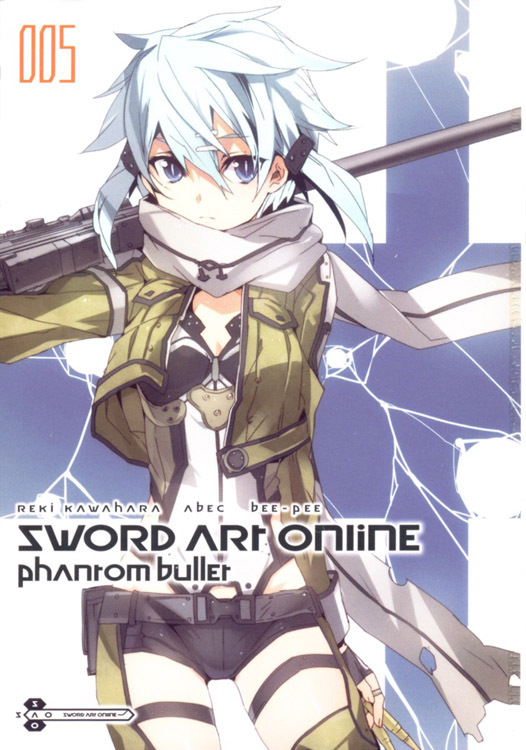 As the driving force of the ‘Sword Art Online’, Kirito has gloriously put Haruyuki of Accel World to shame. The credit is owed primarily to Kawahara, for making a vigilante pariah clad in black takes the mantle of the main protagonist. An outcast for being a beta tester of the game, Kirito uses solo playing approach in leveling up. His high intelligence, diligence and calculative nature slowly take him to the realm of strongest players in the game. 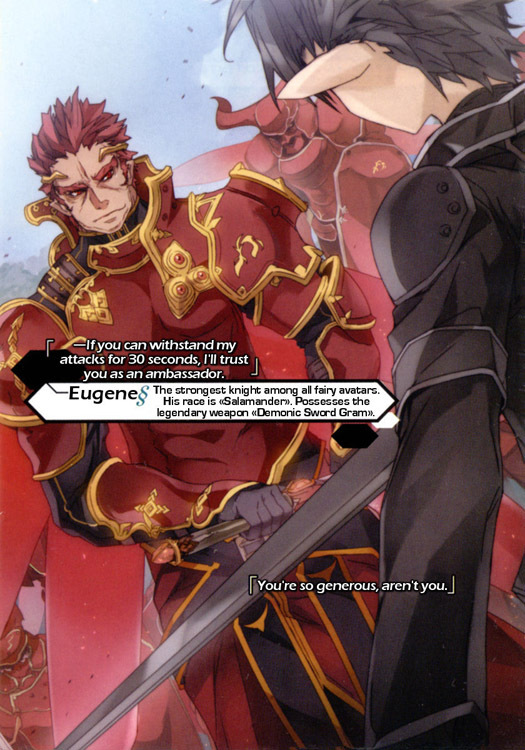 His reputation has earned him the nickname of ‘Black Swordsman’, and becomes an unanticipated symbol of hope for the denizens. Being a leading role who keeps racking up legend after legend in almost each game he steps in is not his only charm. Kirito is also known for his smart retorts and subtle jokes from time to time, which sometimes reminds me of Araragi Koyomi in Bakemonogatari series. His mischievous side that usually takes form in him teasing the girls is also fairly entertaining. While excessive kindness to others is a natural cliché occurrence in shounen works, it mixes pretty well with his other traits, making Kirito a very likeable protagonist worth remembering in the long term. 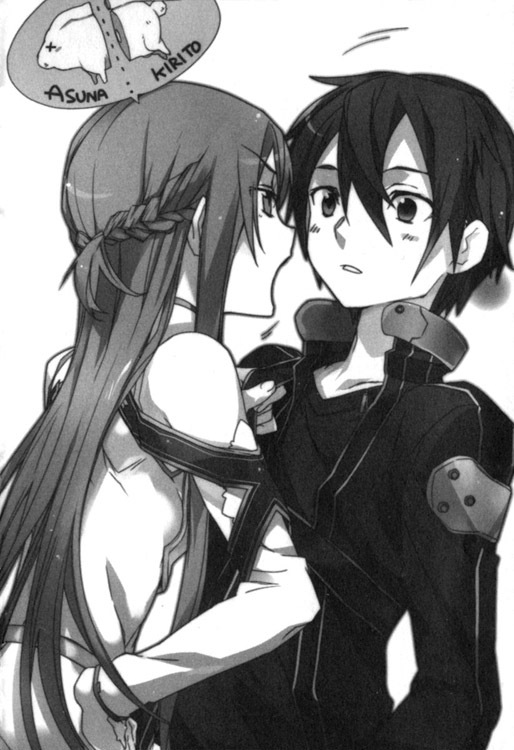 Adding more to the list of pluses, Kirito’s deep, enduring relationship with Yuuki Asuna, Aincrad’s idol and sub-leader of the strongest guild in the realm, The Knights of Blood, certainly sets a brighter and sweeter note amidst the grim nuance of the early plot. Her graceful presence and buoyant spirit, brimming with energy and steel resolve to beat the game harmoniously balance Kirito’s carefree attitude. Their gritty determination to stay close together and live a happy life within the waves of anxieties and tensions are very compelling and quite moving, like that of a riveting drama. Other characters are also well planned and customarily terrific in terms of depth. 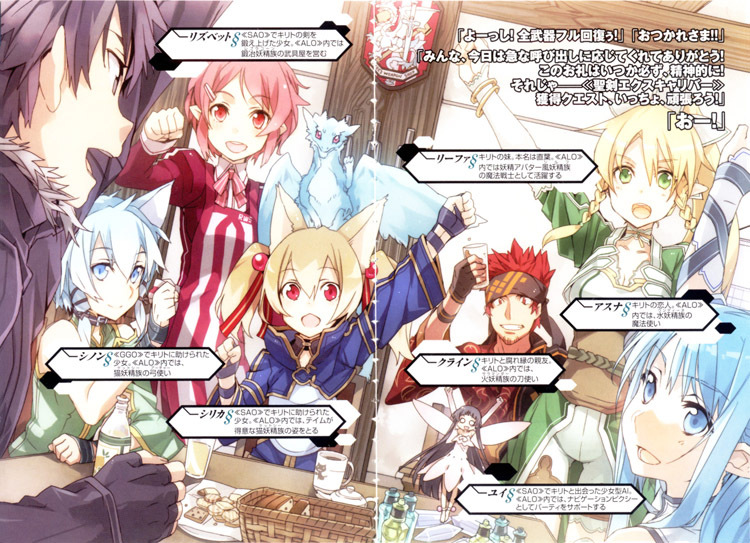 And space is carved out nicely for Kirito’s potential harem kingdom members, as his little sister (cousin in fact) Suguha turned Sylph ace Lyfa in ‘Alfheim Online’, Asada Shino who is a cold, ruthless elite sniper within the iron nuanced world of ‘Gun Gale Online’, and Alice Synthesis Fifty the Integrity Knight in ‘Underworld’; each an iconic figure and central character within their respective game, join Kirito’s inner circle. Hats off for their commanding nearly every scene in which they are the leading roles. Jumping around from one game to another, while moving the tale forward with game developer and twisted individual shenanigans acting as its core is clever and exciting. The story so far is complex, intense, and sharply executed. Nevertheless, Kawahara has to be really careful for a possible misstep, as four games are close to become ‘one too many’. If he decided to add another game for the next story development’s setting and failed to raise the bar high enough, it would turn into an oddly off-key that ultimately became repetitive and tediously wearisome. But at the moment, there is no doubt that Kawahara Reki is one of Japan’s best and brightest. P.S: On the other hand, SAO anime has its story moves in chronological order, so the story picks up rather slowly if not stalled. After episode two it falls flat and has yet to live up to its novel’s reputation. Mediocre so far. with reference from a friend, i started reading this light novel. at first, i was half minded reading it. such thing as “how can an ONLINE GAME can be transfer into a NOVEL?” came out of my mind. well, i was soon think otherwise, 1 quick chapter and i cant resist to read another. not to mention the exciting illustration and the way the writer exegesis the world. if im not mistaken, the writer have win some award with his novel. i highly recommend people to read this light-and-interesting fantasy novel. and for those with high battling imagination ability, i am most certain you will enjoy this novel. To be precise, Kawahara Reki did win ‘Dengeki Novel Prize’, however it was awarded for his other work “Accel World” in 2008. It was the second time he submitted a work to be nominated for the prize, as in 2002 he actually submitted SAO, but did not send it in the end because the novel pages exceeded the limit given by the judging committee.